Save Cavalry Park campaign - help needed! Colzium House - the perfect venue for your conference, reception, or community event, at very reasonable prices: enquire about booking, prices, facilities etc. Features: The site of a ruined castle, built by the Earl of Lennox in the 12th Century. Extensive walks and rides in delightful ancient woodlands, walled garden, a romantic glen with many waterfalls, medieval ice-house, unusual pets cemetery, bandstand, memorial to the Battle of Kilsyth, clock theatre, (right), pitch and putt golf course, arboretum of rare trees, remains of Colzium castle, curling pond, access to Banton Loch, cafe in Summer season, public toilets, grassy open glades for picnics, kite flying, football, sledging and family fun. The mansion was built by the Edmonstone family of Duntreath. The work was started in 1783 and considerable additions were made in 1861. Some of the masonry from the castle was used in its construction. the architectural style is a mixture of the Scottish vernacular and the more modern renaissance mode. after the First world War, the family started to sell parts of the estate. 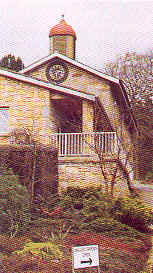 W Mackay Lennox bought the house in 1930 and in 1937, on his retiral as Town Clerk, he presented the House and its policies to Kilsyth Burgh, in memory of his mother. The walled garden has an excellent display of conifers and rare plants. The wrought iron gates to the garden were presented to the Estate by a youth club in Kilsyth some time ago. The attractiveness of the gardens has been highlighted by their being featured not only on the front page of The Herald's "Homes and Gardens" section, but also on "The Beechgrove Garden" on BBC Scotland. The garden is certificated by the Scottish Association of Visitor Attractions. It is open from 12 noon - 7pm, April till September and 1.00pm - 4.00pm Saturday & Sunday. 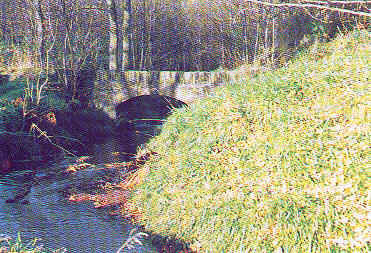 The Lade was built in the mid- C18th to supply water to the Forth and Clyde canal via the Banton loch. It comes down from the Garrel Mill skirting the grounds of Criagengoyne Nursing Home, then flowing through the estate to Banton Loch. It flows gently alongside a mature beech avenue approach from the Tak Ma Doon Rd., to join Banton Loch at the site of the Battle of Kilsyth. What little remains of the 16th century Colzium Castle is now part of a cottage wall. The estate was originally owned by the Earls of Lennox who built a motte at nearby Castlehill during the 12th century. The estate passed to the Callenders and, through marriage, became the estate of the Livingstons of Callender, who constructed an L-plan tower. Towards the end of the 16th century the family added a large hall to the tower, the few remains of which have survived to this day. In 1645, James Graham, Marquis of Montrose, camped his army on the estate before going out to defeat General Baillie's covenanter army at the Battle of Kilsyth. The battleground, now the Townhead Reservoir, was flooded in the 18th century as part of the construction of the Forth and Clyde Canal. In 1703, the third Viscount Kilsyth had Colzium Castle razed, shortly before he inherited the estate. 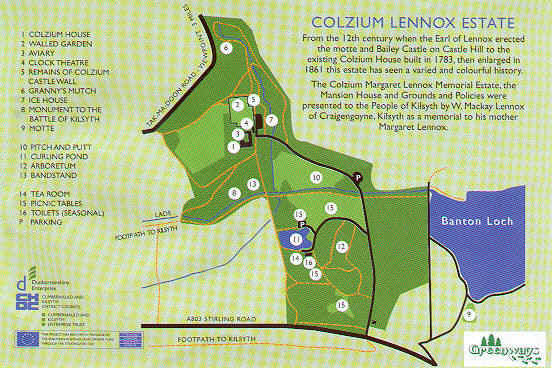 Then, 80 years later, the Edmonstones took possession of the land, and during the 19th century they completed the construction of Colzium House, less than 400 yards from the ruins of the old castle. The Edmonstones returned to their ancestral seat at Duntreath in the early 1930's and the near-derelict house was bought by the Lennox family who handed it over to the burgh of Kilsyth in 1937. In 1977, the tower's foundations were removed to make way for a car park. Location: The estate can be reached either by walking from the town centre and turning right on the Tak Ma Doon Rd, or from the Stirling Road. Car parking is available in the layby off the Stirling Rd., by the curling pond, or at the House. Colzium Autumn 2003 - the most colourful on record!